The search for the first flower has been a prime driving force for botanists interested in the evolution of seed plants. The question as to how the first flowers appeared has been famously referred to as the “abominable mystery” by Charles Darwin. Flowering plants are believed to have evolved around 140 million years ago. This is a time so deep in prehistory that it is difficult for the human mind to conceive. Remarkably, a lineage of plants that has existed since then still exists. And when the age of molecular sciences came about, a relatively unknown plant was about to make headlines in the scientific world, and earn a prominent place in the evolutionary history of plants. This plant is none other than Amborella trichopoda. Amborella is a rare understory shrub or small tree found only on the island of New Caledonia. Amborella trichopoda is the only species in the genus, and is the only member of the family Amborellaceae. It was known for some time already, that Amborella wood has a peculiar character – it lacks the vessels characteristic of most flowering plants. This lack of vessels is a trait that is more typically associated with conifers, and is therefore thought to be a primitive trait in the evolution of plants in general. There are a few lineages of flowering plants which also lack vessels and these lineages are also considered to be very old plant lineages. 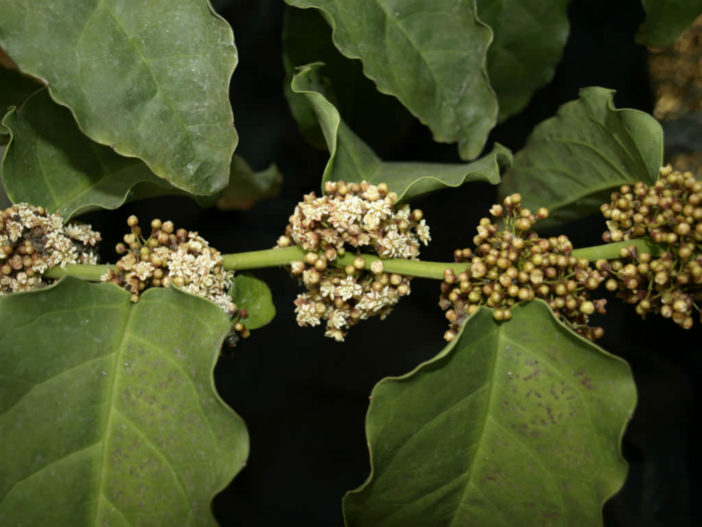 However, it was only at the advent of the molecular age that Amborella was finally assigned it’s rightful place at or near the base of all flowering plant lineages. Amborella thus represents a line of flowering plants that diverged very early (about 130 million years ago) from all the other known species of flowering plants. Knowing the history of Amborella and standing beside a live specimen is a strange experience. One gets the sense of how a prehistorical landscape with Amborella might have looked like. In a time before flowering plants dominated the earth, humble Amborella-like shrubs must have eked out a meagre existence in the understoreys of a conifer-dominated forest. And the descendants within the Amborella lineage have persisted long after the demise of the dinosaurs, to witness now the dominion of the most advanced of flowers. Such is the drama of a very-likely-to-be spurious imagined botanical ancestry of Amborella. But the real story that has led to Amborella’s presence in our world, in our time, is lost in a long broken line of ancestors, with no fossils yet to link any dots. Charles Darwin’s “abominable mystery” is still just as abominable now, as it was a century ago. Standing before Amborella, I ask of her ancestry. She smiles and remains silent.